Today, 103 IHE Delft MSc students received their official QGIS certificates after finalizing a GIS course. In this course, the students learned about QGIS, an open source desktop Geographic Information System (GIS). Also today, a new online course on QGIS was launched. GIS is an important tool for integrated water resources management and environmental studies. GIS can be used to pre-process data for hydrological and environmental models. It is also an essential tool for spatial planning and visualisation of spatial data. Today open source software, such as QGIS, offers many people the ability to use GIS without a license cost. IHE Delft already offers various training modalities dealing with the subject of (Q)GIS, including OpenCourseWare, short courses and tailor-made training. 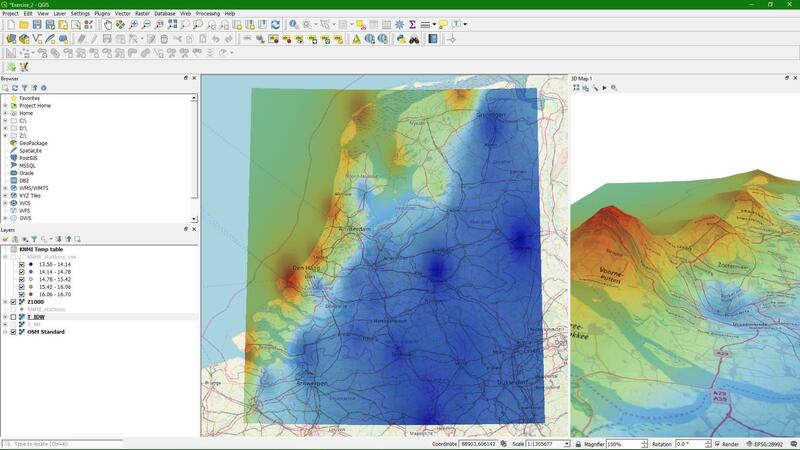 The new online course on QGIS is launched today by IHE Delft in cooperation with Nieuwland Geo-information. This course gives the benefit of guidance and online assistance to participants of the course, and those who successfully complete the online course will receive an official QGIS certificate. The online course on QGIS was developed with the aim to help students and professionals to apply GIS in their own working environment and at their own pace. The course focuses on basic skills. The e-learning platform offers theory in text and videos and exercises with QGIS 3.4. Participants will learn how to georeference a scanned map, digitize vectors, import spreadsheets, join attribute tables, perform basic vector analysis, and to use open data and design maps. During the course the participants' knowledge is tested with interactive questions. At the end a map has to be submitted, which will be marked by the lecturers. Three experienced lecturers are available to assist the participants during the course: Hans van der Kwast (IHE Delft), Peter Kaspers (Nieuwland Geo-information) and Sabine Schnichels (Nieuwland Geo-information). The eLearning platform provides a forum for interaction with the lecturers. For more information on the online course, and to register please refer to this website: http://www.learning-gis.com. During the hackfest we contributed to water-related plugins. One of these plugins that visualizes flow direction can be seen in this video. Read more about the QGIS International User Conference in A Coruna (Spain) here.